Recently Jane Mayer (2019) of The New Yorker wrote about the very close relationship between Fox News and President Donald Trump, outlining in great detail how the Murdoch family–owned news outlet functions as a tacit communication operation of the Trump White House and its political agenda. There is a revolving door of former Fox News staff working in the White House and former White House staff working at Fox News, and according to many sources quoted in the article, Fox News has erased the lines of journalistic integrity and is now functioning as a Trump propaganda machine. Mayer argued that with respect to programming, it was often unclear whether Trump controlled Fox News or Fox News controlled Trump. Meanwhile, the president himself continues to decry the “Fake News Networks,” by which he seems to mean any outlet to the left of Fox News. According to anonymous sources cited in Mayer’s article, President Trump had such animus toward CNN that he attempted to block AT&T’s purchase of Time-Warner, the parent company of CNN. The Trump Administration’s Department of Justice sued to block the merger, but in June a district court judge approved the deal (Ivanova 2018). Conservatives who, like the President, believe the mainstream media (MSM) have a liberal bias have been supported by evidence that journalists are more likely to identify as Democrats than Republicans. A 1990 poll of forty-nine editors and writers at The Washington Post found only one person, Tony Kornheiser, a sports columnist, was a registered Republican, and he suggested he was a RINO (Republican in name only): “I don’t think the Republican Party would claim me” (Wemple 2017). A 2014 study conducted by the University of Indiana School of Journalism found that 28 percent of journalists surveyed identified as Democrat and 7 percent as Republicans. Fifty percent said they were Independents (Willnat and Weaver 2014). 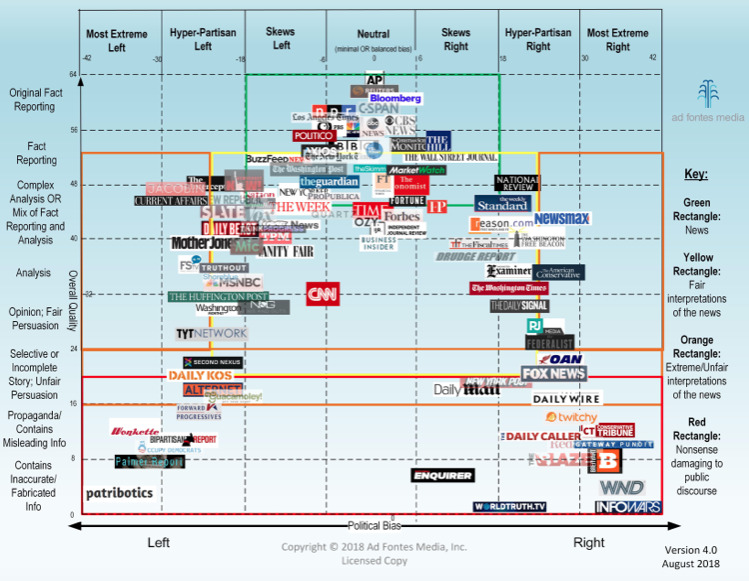 In recent years, Ad Fontes Media has produced a media bias chart for many of the most popular news sources (see below). The horizontal axis of the chart plots the left or right political bias of the source, and the vertical axis plots the factual nature of the reporting, ranging from “Contains inaccurate/fabricated info” at the bottom to “original fact reporting” at the top. The result is an inverted-U–shaped function with the most politically biased sources on both ends of the spectrum rating low on factual material (e.g., Occupy Democrats, Breitbart News), and the most politically neutral sources tending to be the highest in factual material. For example, the Associated Press, Reuters, and Bloomberg were rated both among the highest in original fact reporting and the lowest in political slant. There are a few media sources that occupy the bottom middle of the chart. For example, the National Enquirer is given only a modest right-ward skew but is also very low on factual information. As the foregoing suggests, the media landscape is filled with politically biased information that spans a wide range of viewpoints, but how biased are the people who receive this information? 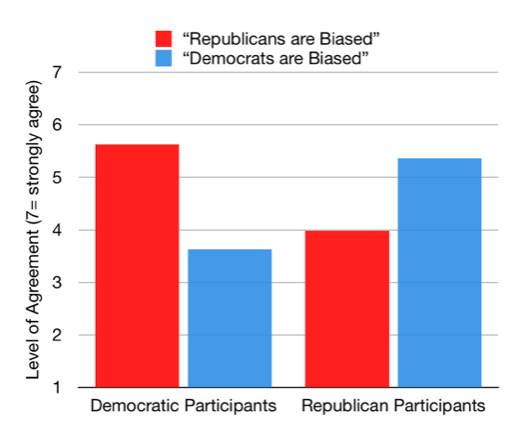 When you ask Republicans or Democrats how biased people of each party are, you get predictable results: Democrats say Republicans are more biased and Republicans say the reverse (see Figure 2). But psychological science cannot rely on the opinions of interested parties for answers. What happens when you put people in an experimental setting where they have a chance to act in a biased or unbiased way? Figure 2. Mean level of agreement that the term biased accurately describes the average Republican or Democrat. Based on the responses of 951 Republicans and Democrats from Ditto et al. (2019a)1. The study of political ideology has a long history in the field of psychology, and the division of U.S. politics into more hardened red and blue positions—which is also happening elsewhere in the world—has made this line of study more relevant. As a result, psychologists have learned a lot about what separates the two sides. John Jost and colleagues (2008), writing in Perspectives on Psychological Science, characterize the two sides this way: The right-wing label has come to represent political views that are conservative, supportive of the status quo, and hierarchical in nature, whereas left-wing views connote progressive social change and egalitarian ideals (127). Jost and colleagues also found that conservatives were more likely to show “system-justifying attitudes,” including support for the idea that economic systems are fair and that equality is undesirable. In addition, research has shown that conservatives and liberals can be separated by their attitudes toward various groups and activities. Table 1 shows a selection of these drawn from Jost et al. (2008). Table 1. Groups and activities that conservatives and liberals have more positive attitudes toward (from Jost et al. 2008). Liberals have positive attitudes toward…. Finally, recent psychological research suggests that these ideological differences are reflected in both explicit and implicit attitudes and are related to core personality dimensions (Jost et al. 2008). Currently, the most popular psychological theory of personality assumes that we possess stable traits that affect our behavior across time and environments. The most popular trait theory at the moment is The Big Five, which attempts to characterize people by measuring their levels of five traits: openness to experience, conscientiousness, extraversion, agreeableness, and neuroticism (McCrae and Costa 1987). Research on political ideology has shown that liberals and conservatives can be distinguished by the degree to which they show two of the Big Five traits: openness to experience (higher among liberals) and conscientiousness (higher among conservatives) (Jost et al. 2008). The Ditto et al. (2019a) meta-analysis was challenged by a paper published in the same issue of Perspectives in Psychological Science by Jonathan Baron of the University of Pennsylvania and John Jost of New York University. On a general level, Baron and Jost (2019) pointed to a body of research showing that conservatives exhibit thinking styles that are substantially higher in dogmatism, rigidity, intolerance for ambiguity, and need for order; whereas, liberals show thinking styles higher in integrative complexity, cognitive reflection, and need for cognition, which involves having a positive attitude toward tasks that require reasoning. This pattern of thinking styles is inconsistent with symmetrical bias for conservatives and liberals. One of Baron and Jost’s (2019) criticisms was that the original 1500 studies from which the 51 studies used in the meta-analysis were drawn would likely have been designed to avoid a strong bias in one direction or another. If such a bias actually existed—in either a liberal or conservative direction—it would be difficult to find it with this group of studies. In a response, Ditto et al. (2019b) were quick to defend the studies chosen for their analysis. But Baron and Jost made another criticism that—to me, at least—is worthy of serious consideration. It is reasonable to be skeptical of information that contradicts your background knowledge on the subject—particularly if you know what you’re talking about.According to Baron and Jost, because the Ditto et al. meta-analysis did not measure or take into account the participants’ knowledge of the topics addressed, it is impossible to know how much of their bias was justifiable and rational and how much was shear politically based prejudice. On some topics, Republicans may have greater background knowledge than Democrats (e.g., economics), but as a general trend, current political history contradicts the proposition of symmetrical amounts of knowledge among the political parties. Research shows that “low-information voters” were an important component of Trump’s support. For example, a 2017 study found that voters who were low on need for cognition and low on political knowledge showed a greater preference for Trump over Clinton in the context of the 2016 presidential campaign (Fording and Schram 2017). If liberals in the Ditto et al. meta-analysis had more knowledge of the issues used to assess bias, then they may have been behaving more reasonably and justifiably than conservatives. But, at this point, we are not in a position to answer that question. So, Who Is More Biased? Perhaps the most honest answer is: We don’t know. The debate between Ditto and colleagues (2019a, 2019b) and Baron and Jost (2019) has revealed some sticky problems that need to be solved before we can make a clear judgment on the matter. Furthermore, the entire enterprise may be a bit misguided—just another opportunity for finger-pointing. Rather than focusing on the contentious and fraught issue of political bias, it might be more useful to highlight people’s relative allegiance to facts. The word bias sounds uniformly bad, but having a preference for certain kinds of information over others—based on the source and on the quality of one’s personal knowledge—is entirely appropriate. If not essential. In a world awash in misinformation (see Figure 1), it is important that we learn as much as possible about the issues of the day and think intelligently and critically about the claims that come our way. There is ignorance on all sides, and intelligence and critical thinking should not be a partisan matter. Baron, Jonathan, and John T. Jost. 2019. 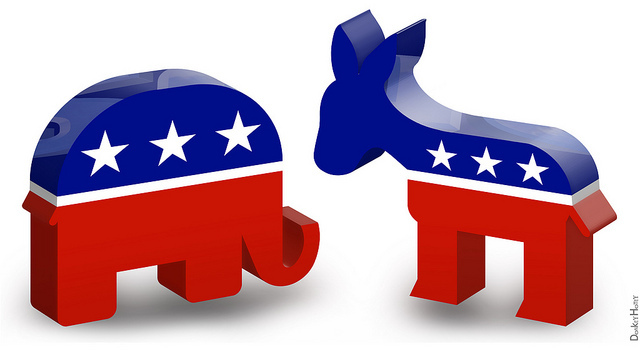 False equivalence: Are liberals and conservatives in the United States equally biased? Perspectives on Psychological Science 14(2): 292–303. Ditto, Peter H., Brittany S. Liu, Cory J. Clark, et al. 2019a. At least bias is bipartisan: A meta-analytic comparison of partisan bias in liberals and conservatives. Perspectives on Psychological Science 14(2): 273–291. Ditto, Peter H., Cory J. Clark, Brittany S. Liu, et al. 2019b. Partisan bias and its discontents. Perspectives on Psychological Science 14(2): 304–16. Fording, Richard C., and Sanford F. Schram. 2017. The cognitive and emotional sources of Trump support: The case of low-information voters. New Political Science 39(4): 670–86. Frederick, Shane. 2005. Cognitive reflection and decision making. Journal of Economic Perspectives 19(4): 25–42. Ivanova, Irina. 2018. Judge approves AT&T-Time Warner merger without conditions. CBS News (June 12). Available online at https://www.cbsnews.com/news/att-time-warner-merger-approved-without-conditions-judge-rules-today-time-warner-stock-price-rises-in-after-hours-trading/; accessed March 11, 2019. Jost, John T., Brian A. Nosek, and Samuel D. Gosling. 2008. Ideology: Its resurgence in social, personality, and political psychology. Perspectives on Psychological Science 3(2): 126–136. Kahan, Dan M. 2013. Ideology, motivated reasoning, and cognitive reflection. Judgment and Decision Making 8(4): 407–424. Available online at http://journal.sjdm.org/13/13313/jdm13313.pdf. Kahneman, Daniel. 2011. Thinking, Fast and Slow. New York: Farrar, Straus, & Giroux. Lord, Charles G., Lee Ross, and Mark R. Lepper. 1979. Biased assimilation and attitude polarization: The effects of prior theories on subsequently considered evidence. Journal of Personality and Social Psychology 37(11): 2098–2109. Mayer, Jane. 2019. Trump TV. The New Yorker (March 11). Available online at https://www.newyorker.com/magazine/2019/03/11/the-making-of-the-fox-news-white-house. McCrae, Robert R., and Paul T. Costa. 1987. Validation of the Five-Factor Model of personality across instruments and observers. Journal of Personality and Social Psychology 52(1): 81–90. Available online at http://www.psychometric-assessment.com/wp-content/uploads/2013/01/5FMPeerValidationCostaMcCrea.pdf. Wemple, Erik. 2017. Dear mainstream media: Why so liberal? The Washington Post (January 27). Available online at https://www.washingtonpost.com/blogs/erik-wemple/wp/2017/01/27/dear-mainstream-media-why-so-liberal; accessed March 9, 2019. Willnat, Lars, and David H. Weaver. 2014. The American Journalist in the Digital Age: Key Findings. Bloomington, IN: School of Journalism, Indiana University. Thanks to Peter Ditto for providing the data required to produce Figure 2.